Authentic and comfortable Renaissance period clothing from Pearson’s Renaissance Shoppe are sure to help you catch the eye of a fair maiden at your next renaissance faire. Having the right costuming is essential for crafting the perfect character – from boldly-colored cotton velveteen doublets and vests, to leather belts, boots, and other medieval accessories we have everything you need to create the perfect look, whether it be for a pirate, peasant, knight, or noble. 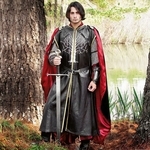 We carry a full line of high quality Renaissance costumes for men, as well as shoes and accessories. Paying attention to small details can take your ren faire look from weekend hobby to professional – that’s why we carry so many period accurate accessories to go with our outer garments. Spanning from the Roman times to the late Renaissance, our authentic clothing is affordable and comfortable; perfect for reenactment actors and faire goers! For all your reenactment, ren faire, and festival costuming needs, trust Pearson’s Renaissance Shoppe for the best period costumes and accessories.